The parish of Newton Purcell lies on the eastern boundary of the Shelswell benefice, on the A4221 between Finmere and Newton Morrell, which follows the line of the old Roman Way. The name is derived from the Anglo-Saxon word "ton", meaning a settlement, hence "new ton" is a new settlement. Although Shelswell still remains a distinct parish, the original church, dedicated unusually to St Ebba, fell into ruin during the 17th. century and it was in the 19th. century, for ecclesiatical purposes, that Shelswell was united with Newton Purcell. For Civil and other purposes, it still stands alone. The first record of any settlement at Shelswell is thought to have been in the 8th. century and it was only in the 12th. century that a manor house was built on the site of the present HOme Farm House. In the late 17th. century, Sir John Cope built a new house of residence at Shelswell, not on the site of the original manor house, but "in a more convenient position, close to the public road between hethe and Mixbury". In the 18th. century, Shelswell was bought by a merchant in the city of London, Gilbert Harrison Esq. (there is a large a large monument to him in the church). In the 1874, his descendant, Edward Slater Harrison, inherited the estate and it was he who pulled down most of the house built by Sir John Cope. He replaced it with a large Victorian mansion to the designs of Mr. W. Wilkinson, architect, of Oxford. This house only stood for some 100 years when, being in a very bad state of repair, it met the fate of so many English country houses and was demolished. Shelswell remains in the ownership of the descendants of Gilbert Harrison and in the year 2000, they restored and converted the surviving stable block into the main residence of the estate, now known as The Coach House. The church, dedicated to St. Michael & All Angels, was originally a wooden building which had been the church of the english settlers in the 12th. century, however the church that you see today was built in the 19th. century. There are two objects of interest, one being the fine Norman doorway which is the only remains of the original 12th. century church. The other is an incised stone to the memory of a heart, which you will find in the north wall of the chancel. This dates from the middle of the 13th. century. The clock was made in the nearby village of tingewick by a man named Packer, and is believed to date from the early part of the 19th. century. The bells, again of local manufacture, are thought to be 14th. century. 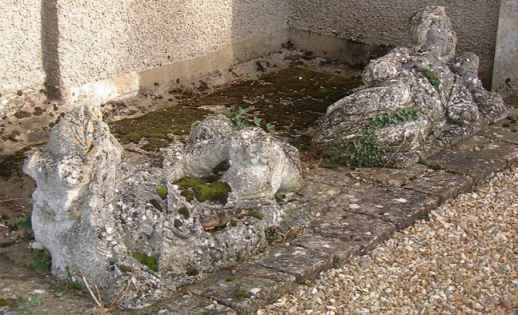 Outside the church lay two semi-recumbant stone figures in the dress of the late 16th. century. They are thought to be memorials of Robert Heath and his wife, who lived at Shelswell during that time. For many years, they lay in a coppice near the site of the old church and were later moved to the front of Home Farm House, then to the grounds of Shelswell House and finally to their resting place where you see them today. The rectory was built in 1897 by the Revd. John Meade and he lived there for 40 years. Subsequent rectors lived there until 1978 when, upon the retirement of Revd. 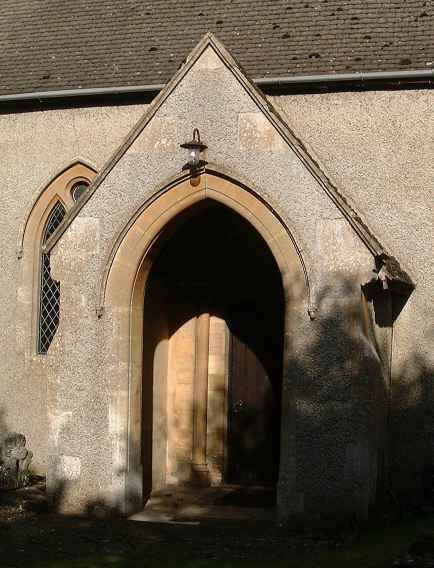 John Sergeant, the diocese decided to sell it and house the incumbant rector in Finmere. The rectory, now known as The Old Rectory, is the home of Mr. & Mrs. Barry Markham, and Mrs. Markham runs a flourishing dental practise there. The Revd. John Meade was also greatly responsible for the building of the School on land given by John Harrison of Shelswell in 1873. This served the education needs of the parish for nearly 100 years and it was only in the late 1960's that it ceased to be a school. was conveyed to the Parochial Church Council and became the Village Hall. Since then it has been a meeting place for the village and for many years, the Finmere Playgroup held their weekly sessions there. More recently, various improvements have been carried out to the hall and it is crrently available for hire for functions and meetings. Any enquiries should be made to Mr. Gordon White on 01280 847483. The main farm house in the village is Elms Farm House and this is thought to have been built on the site of an earlier dwelling to replace the Manor House of the Purcell family which had fallen into ruin when they left the village in the 15th. century. This manor house is thought to have been built of wood, as no stones remain on the site which lies to the east of the present A4221 and was surrounded on three sides by an old moat. At the beginning of the 20th. century, great changes were seen at the northern end of the village, with the building of one of the lest new railway lines in the country which ran between Calvert and Rugby. The station in Newton Purcell (always known as Finmere station) was quite sizeable with many sidings and it generated much activity. Children from the village would go to school in Brackley by train and local produce including milk would be sent to London. The Sheslwell Arms, located very near the station, saw much trade as a result of the line. Visitors today can still see the splendid range of stables at the rear of the main building, which used to take in horses at livery. Those wishing to hunt with the Bicester and Warden Hill Hunt, would very often travel up from London with their horses and hounds by rail, and then go on the various meets. Sadly, after only some 50 years, the station and line were victims of Dr. Beeching's rationalisation of the railway system in England and were closed. The station master's cottage has over recent years, been carefully restored and enlarged by Mr. & Mrs. David Jones, to make a delightful home. There are two outlying farms that should not go without mention. To the north is Boundary Farm, where Mr. & Mrs. Wallace Cross have built themselves a very pleasent new farm house and from where they run a haulage business. To the south, Newton Morrell Farm, which for many years was farmed by Mr. & Mrs. Richard Smith Bingham, is now the home of the Alderton family. Today, the land within the parish of Newton Purcell with Shelswell, is still entirely agricultural, but with modern farming methods and fewer people required to work on the land, mamy of the houses are occupied by people working in other sectors, both within the locality and further afield.